I told my immediate superior who said I should report it to the administrative people on Monday. No idea why she didn't do it then, so Monday I will mention it if it is not back on the hanger. If it doesn't turn up, I fully plan to push to be recompensated for it, plus to have a locker of my own. I can imagine them saying "you left it in the cloakroom, it's your problem" which is a bit of a bogus excuse when they don't have any sort of secure place for me to dump stuff ("all of the lockers are taken, tant pis"). I'll let you know what happens. Incidentally, so much for their idea of 'sterility' wearing a white outfit, face masks, and hair-net things. I wonder how much cat fur fell off of my coat if it was, indeed, in the cold storage room? Oh well, it isn't my problem. At work there's a nifty cutting machine that uses a tiny stream of extremely high pressure water to cut cakes. I always saw it cutting rectangles, but today it was cutting circles. Nifty. Anyway, as I was tidying up, the LCD on the machine said "CNC Link Error" and something about PLC. If I remember from my boarding school nights, when I used to lie on my bed reading the RS catalogue (for fun), anyway, I recall a PLC is a "Process Logic Controller". I saw a picture in a catalogue when I was about fourteen and I'd have to wait twenty years to see one inside something. 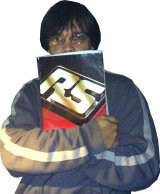 I have an RS catalogue here. It's the size of a decent phone book. As I probably pored through it in detail more than the entire staff added together, my Physics teacher said I could take it home at the end of term. It is dated July-October 1988. Yup, that's the one. PLCs are in section 23 starting on page 478. Days when you could get a 6502 processor (3MHz CMOS) for £5.24. Don't ask how much a V.23 (!) modem will set you back. It's scary. So my request is this: Do you work for a company that uses RS or Farnell catalogues (or similar)? If so, do you have any old ones (like earlier in the year, 2007,...) that you could send me? If so, please email me for my address! That word, said something like gah-spee-yah-j is the French word for "wastage". Mom said to me that she wanted to buy a 'eco-friendly' coffee maker, namely one that takes those tea-bag things and not plastic/foil sachets. Weeks ago, I would have agreed. However knowing now that the place where I work throws out more plastic wastage in an hour than I could accumulate in coffee containers in my entire lifetime, it does rather put a different slant on things. Here's another. My shift ran from 5am to 12h30pm (the 'old' hours). During that time I was primarily the one sorting out the green bags. Certainly on the weight form it was all my writing except for two entries! Anyway, because I'm crap at maths, in my head I rounded-to-nearest and kept a tally of the little lemon-on-shortbread things. I think they are "amuse-bouche", but really it's like the world's tiniest lemony custard flan, about 3cm across? Now bearing in mind an assortment of maybe 12 or 16 of these things will be shrinkwrapped, boxed, and sold for something in the order of €3 to €6, can you imagine what the losses were? Remember, rounding to nearest so it isn't a precise figure, the value I arrived at was 107kg. Yes, one hundred and seven kilograms. That's about 236 imperial pounds, for those who measure the old-fashioned way. That's heavier than me! That's actually quite a bit heavier than me! And that's in the course of one shift. Now, I cannot tell you what 'percentage' that is of the overall creation, if 107kg of toss-outs for one product is a lot or not, but for me, given the food shortages and the global food price rises, that is an appalling figure. I know I can never be a 'management' type, but I do wonder how much of this could be averted by having the staff work slower and more methodically. It's always such a rush, so much to do and so little time. The production line is like "add, squish, add, squish, add, squish...". Could it be that losses would be reduced if everybody took a little more care and time in their work? Maybe I'm missing the big picture. Maybe nobody gives a crap about losses so long as targets are met. More time = fewer targets? Perhaps that's how we arrive at figures such as these? Validation Are you real? Please type 87790 backwards.